Politics are all around us, playing out in national, local and even domestic governance. Politics have to do with the polis, the people who make up groups of any kind. In that sense, politics are unavoidable. Our relationships with others always contain a political element. Party politics are a subset of politics in its broad sense. Party politics are partisan, ideologically informed patterns of thought and action that suggest how politics should translate into governance in a way that is consistent with a set of underlying values. They condense around different beliefs in power relationships between governors and governed, in the rights and statuses of the different groups that make up the polis, in the control and dissemination of information, and in the responsibilities of government and individuals towards one another. 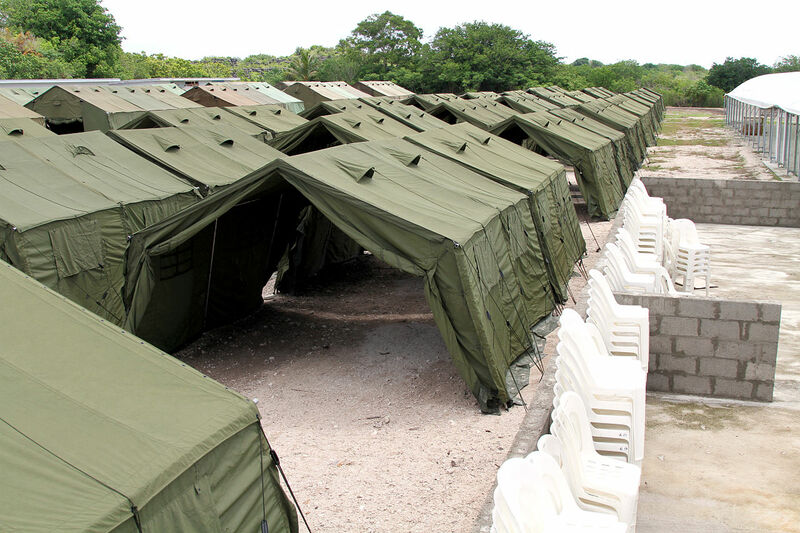 Accommodation in the Nauru offshore processing facility. Party politics is made up of what Gallie termed ‘essentially contested concepts’. No one, for example, disputes the existence of the multitudes of people fleeing poverty, instability, persecution and fear. Nor do they dispute the reality of the moral and practical problems they pose for the countries to which they try to flee. But the agreements end at about this point. Some interpret this mass movement as a challenge to their sense of humanity and to their obligations to observe human rights. Others, while acknowledging the human problems of displacement, feel that local territorial rights and laws take precedence, and that the welfare of the host countries is paramount. Turning unregistered and unscreened refugees (“illegals”) away is, in that ideology, a better and safer and fairer alternative to dealing with them by taking them in. Australia has been foremost among western countries in ‘turning back the boats’ and in making off-shore detention inevitable for those who do manage the journey, pointing to the success of that policy in preventing drownings and restricting the numbers of refugees who reach Australian territorial waters. By contrast, Italy has done its best to rescue enormous numbers of people fleeing North Africa, and to find some kind of accommodation for them. Neither side can be said to have found ‘the’ answer to a massive humanitarian crisis. Italy’s resources have been overstretched. The Australian mode of management appears to contravene United Nations conventions on refugees. Into the middle of this dilemma, which is partly political in the broad sense and strongly party political in a narrower sense, came the Report into Children in Detention, chaired by the Australian Human Rights Commissioner, Gillian Triggs. 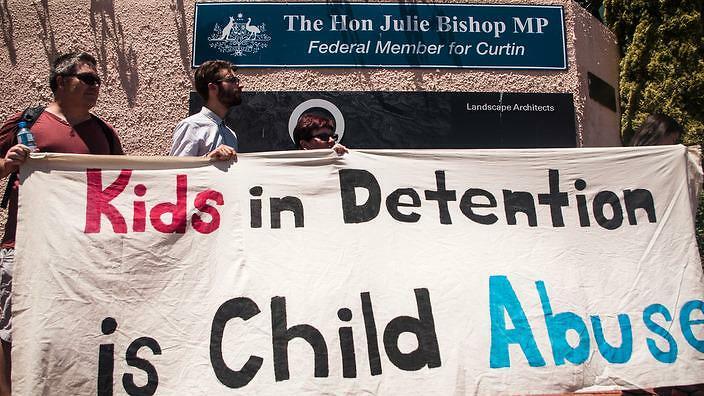 The Report found more than 200 children to be in off-shore or Australian detention under conditions that harm their development and infringe the UN statements on human rights. The Commission’s findings seem to be supported by doctors who have visited the detention centres, and by various leaks from people who have worked in Nauru and Christmas Island. The Australian Government’s response has been to deny the accuracy of the report, to attack Triggs’s integrity, to accuse her of partisan reporting, and to call for her resignation. The report calls for the early release of children from detention, and for proper acknowledgement of their rights, particularly their rights to grow into reasonable adulthood, equipped with education and some sense of identity and stability. It makes many comments about the suffering of adults, but its focus is on children and the overwhelming impact that violence, insecurity, uncertainty, heat, lack of space and lack of hygiene will have on their lives. The report does not deal so much with the original party-political decision to turn back the boats. It does take issue with both political parties’ decisions to enforce mandatory detention, and it does so predominantly in the context of the impact of that policy on children. It makes disturbing reading. Presumably that is why it has provoked such extreme responses from both sides of party politics. On the right, party politicians and right-wing newspapers have belittled Triggs and accused her of bias against them, of dishonesty and inaccuracy. They question the timing of the inquiry, which began soon after the election of the LNP in 2013. They have recommended imprisonment for anyone who leaks relevant information to the media, such as those who supplied some of the information that Triggs relied upon. On the left (and in the centre), politicians, commentators and media have called for the report to be taken seriously, for secrecy to be lifted and for legislation to protect refugee children. For these people, the timing of the report is irrelevant because its contents demand some major response. At the same time, those who oppose the present government’s theories and practices have used the report as a lever to destabilise the government’s refugee policies more generally, pointing out that what happens to the children is a consequence of what happens to “illegal” refugees at large. That the government’s vigorous attacks on the report and its author suggest that they had a pre-formed notion of what the report should say. Essentially contested concepts make up a significant part of our ‘political’ lives – they always have and they always will. What is important is the way in which these contests are handled. 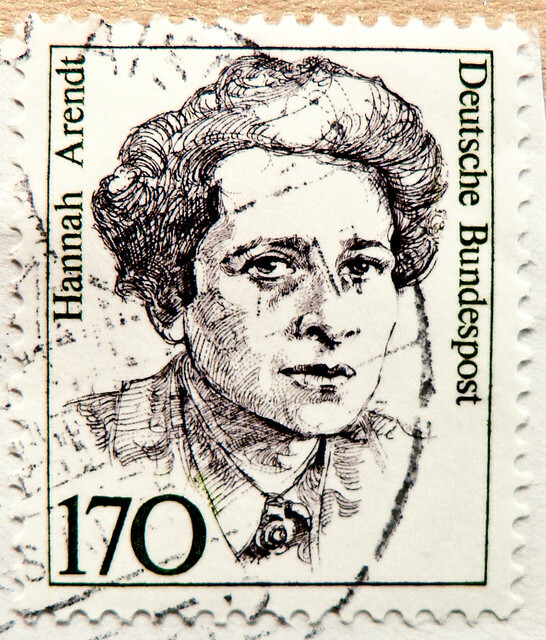 A totalitarian government will settle them one way; a liberal democracy will try to find another. What is at stake in this confrontation is not Gillian Triggs’s credibility, but the public perception of its preferred mode of government. Apparently, more than 50% of the population approve the present government’s approach to refugees or believe that it should be more extreme. We can only hope that they understand that Triggs, in her appointed role as Human Rights Commissioner, was writing about children in detention, and that government decisions to discredit her well-supported findings by political force majeur raise serious concerns about the reality of our much vaunted participatory democracy. Miles was the Founding Director of the Centre for Values, Ethics and the Law in Medicine (1996-2003). He was also the Foundation Professor of Surgery at Westmead Hospital in 1978 and a Co-Founder of the World Association of Hepatic, Pancreatic and Biliary Surgeons (1987). Since 1996, Miles is an Emeritus Professor of Surgery at the Sydney Medical School. At the VELiM, he continues to teach and is directing the Cancer Survivorship Project. Miles interests include Medical Sociology and Biomedical Ethics. He is also a published poet. Size matters. At least, that seems to be the media’s belief when it comes to analysing social problems. The grimmer the stories, the uglier the experience, the more bodies at the bottom of the cliff, the better. And last night’s episode of ABC TV’s Four Corners didn’t disappoint, with its expose on bullying among surgeons and the devastating consequences this entrenched practice has for its victims, both in the short and long term. Despite casting their net wide, the show’s producers found only three medical professionals who haven’t spoken out about this issue before, and only two chose to be identified. Imogen Ibbett and Vyom Sharma have now joined the growing ranks of doctors, such as Dr Caroline Tan and Dr Talia Steed, in breaking the silence around the destruction of careers and health that doctors cause among their own. But noticing the growing pile of bodies at the bottom of the cliff is only helpful if it triggers the essential questions – who or what is pushing them off and what can be done to stop it? The program notes that this is not just a problem for women, or surgeons or even just the medical profession; it’s a public health issue that demands action. Indeed, women can also be perpetrators as Imogen Ibbett’s allegations against Helen Maroulis clearly demonstrate. But most significantly, the show highlights the risk bullying, scalpel-throwing surgeons, misogynist physicians, and harassed and cowered trainee doctors pose to the lives of patients. The problem starts early, in medical school; both local and international research persistently show most medical students experience mistreatment during clinical placements in hospitals. Our recent – about to be published – research found 74% of Australian medical students experienced mistreatment during clinical placements and even more witnessed it. Similarly, a 2014 US study found 83% of medical students experienced some form of mistreatment during medical training in hospitals. Although student reports of mistreatment may be interpreted by some senior staff as just over-sensitivity, research shows students perceive negative events in a similar way to physicians and nurses. Unsurprisingly, under-reporting is common. Mistreatment of medical students is at odds with the explicit teaching about professionalism in medical training, leaving many confused. But some others become medical teachers who “mete unto others what was perpetrated against them”. The effects of all this “teaching by humiliation” can be profound and enduring. Medical students’ mental health has been shown to decline throughout medical training. And this can lead to poor self-confidence and burnout, binge drinking, stress and depression, and substance abuse, broken relationships, suicide and early exit from the profession. Mistreatment can create cynicism and reduce empathy, which may directly affect patient care. Students are also distressed when they see doctors mistreating or being disrespectful to, or about, patients. Patients can clearly be directly affected by the way the autocratic medical culture affects working practices and ineffective communication causes health-care errors and poor patient safety outcomes. In fact, this kind of culture poses an extreme threat to patient care, like the notorious “Butcher of Bega”, Graeme Reeves. After 35 formal complaints of bullying and harassment were made about Reeves by other doctors, nurses and patients over a 15-year period starting in 1985, he was deemed “a person unfit to remain on the register of medical practitioners” in 2004. Behind him lay a trail of dead and mutilated patients and aggrieved and frustrated doctors and other staff. But much bullying and harassment is subtle, insidious and harder to prove and act upon. Indeed, Four Corners shows how one doctor’s tormentor can be another’s mentor. Dr Imogen Ibbet finds Dr Tan’s tormentor, Chris Xenos to be professional and respectable, for instance, but feels very differently about Dr Helen Maroulis’ behaviour. And all the bad behaviour is difficult to police because mistreatment is often so subtle and secretive it can be impossible to deal with, especially when the victim is made to feel both responsible and powerless. In the program’s attempt to look for solutions, it’s confronted by the apparent buck-passing of responsibility between the Australian Medical Association (AMA), the professional colleges and the workplaces where bullied doctors work. Four Corners and BeyondBlue have nailed the problem that’s pushing people over the cliff: workplaces that have allowed a culture of humiliation, bullying and harassment to prosper with inadequate pathways for action. And the fence that’s needed at the top of the cliff to prevent the falls is now also becoming apparent. If bullying is a workplace issue, and the workplace is funded on the public dollar, then the public needs more say in hiring and firing practices. Nothing can change until young doctors are safe in the knowledge that the people they need to complain about no longer have absolute control over their careers. And there’s an example that can be followed. Training to become a specialist in general practice is no longer directly under the control of either of the general practice colleges. Rather it’s contracted out to 17 regional training providers. The role of the general practice colleges now is to improve practice quality as a whole, build collegial relationships, and provide continuing education and opportunities for its fellows and members. This may be a model we need to emulate for all medical speciality training. While it will never be possible to completely remove the apprenticeship model from medical education, it’s possible to ensure progression decisions are made by those at arm’s length from training and that merit, not nepotism, prevails. Kimberley Ivory is Senior Lecturer, Population Medicine and Sub-dean Student Support, Sydney Medical School at University of Sydney. Karen Scott is Senior Lecturer, Education, Discipline of Pediatrics and Child Health at University of Sydney. CLINICAL TRIALS – Human clinical trials are an important last hurdle in the development of new drugs and therapies. Today, The Conversation takes a closer look at this vital scientific endeavour with three articles that look at different aspects of the process. Testing new drugs in clinical trials is a billion-dollar industry in Australia, with most of the money coming from international pharmaceutical companies. But as investment grows in India, China, and other emerging competitors, some people argue we need to make Australia more attractive to such investment. One of their solutions is to water down the ethics approval process. a nationally consistent approach to ethical standards to reduce complexity, speed up the process and where possible, rationalise the number of ethics committees to reduce the large number that currently exist. Before major changes are introduced, however, it is important to remember that ethics committees are the very bodies that ensure the safety of clinical trials and maintain public confidence. Developed in response to concerns about the untrammelled power of medical institutions in the 1970s, as well as reports of egregious excesses by researchers in the United States and elsewhere, the ethics committee system has become highly refined in both its processes and in the substance of the issues it addresses. In Australia, it is also remarkably devolved and democratic, drawing in thousands of men and women from different walks of life across the country to engage in conversation, for no personal gain, about ethical issues in health care and research.